My Desire HD is getting long in the tooth. I’ve been waiting for the Ice Cream Sandwich update ever since HTC announced it would be “coming soon”. Well, for me, it turns out, “soon” wasn’t soon enough. Using the Ace Hack Kit (The Desire is known as the HTC Ace in other territories) from this post, I downgraded and then rooted my phone. I used Ubuntu 32-bit for this, as there was then no issues of crappy windows drivers bricking my phone. the “effen manual” from the Ace kit has a handy section about running from an Ubuntu LiveCD if you haven’t got an installation. The reason for the downgrade, is that the version of Android I had installed was not able to be rooted. I accepted the defaults and carried on! The phone was wiped, but I knew this would be the case anyway, so backed everything up to my MicroSD card, and used a spare to do the downgrade/root. Once this was complete, I could hold Volume Down and power when switching on to get to a boot menu, where you can enter a recovery mode, and update the phone with a zip file placed on the SD card. The Zip file I used was from here – an unofficial port of CM9 for the Desire HD. The only issue I found was that I had to use Clockwork Recovery to factory reset the phone before I did the upgrade. I didn’t do that the first time, and after waiting 30mins for the first bood, decided that something had gone awry. I re-entered clockwork, factory reset, and applied the update again. Everything went fine that time. Once the update was applied, it’s like a different phone. Free memory is much more than on Android 2.35 – I was normaly hovering around 75Mb free before. Now it seems to hover around the 200Mb mark! Everything is smoother, and doesn’t suffer from the juddery scrolling that it had before. CAVEAT: The only thing that I have found not to work is video recording. Trying to record a video causes the camera app to stop responding, get forced closed, and crash on launch until the phone is rebooted. This isn’t too much of an issue for me, as I rarely use it for that – but it may be something to think about if it’s a feature you use regularly. 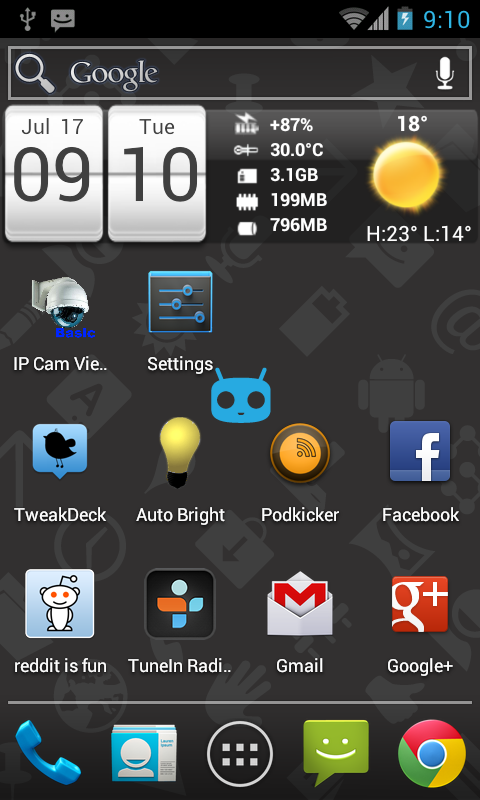 This entry was posted in Tech and tagged Android, CM9, Desire HD, Geekery, ICS, upgrade by Admin. Bookmark the permalink. Just an addendum to this – Video recording does work, but only in 480p(SD) mode. In the Camera app, select video, and hit the seetings button – you can change to SD mode there.